"Today we once again venture forth into the deepest depths of insanity known as 'the Silver Age' - when comics cost 12 cents, Superman could juggle planets with his pinky finger, and stories didn't have to follow anything like 'logic' or 'natural plot development'!" The Silver Age lasted from 1956note Some Marvel partisans claim 1961, instead, for the first issue of Fantastic Four to about 1972 (although some people count everything up until 1985 as part of it, folding in the The Bronze Age of Comic Books). Note that this is the period that spawned the Adam West Batman series and the Superman Broadway musical, and no, this is not a coincidence. The Silver Age was a time of talking gorillas and super-powered pets, of covers that were created before the story and seventeen types of Kryptonite. It was naive and visionary, futuristic and outdated. And every Superhero comic published today owes something to it. In the late 1930s, the Superhero was born. The genre quickly exploded, with hundreds of titles published at the height of the time now known as the The Golden Age of Comic Books. Unfortunately, by 1950, the popularity of superhero comics had declined precipitously. This was due largely to the end of World War II taking away nearly all of the go-to enemies for heroes to fight, plus the knock-on result of people just being tired of fighting in general. During this period, superhero comics slowly vanished from the stands, to be replaced by horror comics, Westerns, monster comics, romance comics, humor comics, and other genres, with only a few (Superman, Batman, and Wonder Woman among them) still surviving. That all changed in 1954 with the publication of Frederic Wertham's Seduction of the Innocent, a book that accused comics of creating juvenile delinquency and sexual "deviancy", creating a backlash that led directly to the creation of The Comics Code, which caused the destruction of the old comics paradigm almost literally overnight. And then, in the September-October 1956 issue of DC Comics's Showcase, something magical happened. A remake of super-speed character The Flash  with a new costume, secret identity, and origin  spiked the sales charts. After a couple more test issues, they gave him his own title, and tried redoing another Golden Age character, Green Lantern. This too was successful, and the Superhero genre was off to the races. Within a couple years, several other companies threw their hats into the ring, such as Atlas, Charlton, and ACG. In 1961, Stan Lee of Marvel Comics was told by his boss to create something in the vein of DC's Justice League of America. Thus, the Fantastic Four appeared on the stands, and Marvel's innovative characterization-based approach to comic books appeared. Thus, some people split the age by referring to the period between the introduction of the Barry Allen Flash and that of the Fantastic Four as the "Early Silver Age". The Silver Age can be split between two approaches  the more old-fashioned Golden Age style with stalwart, lantern-jawed heroes solving the plot through logic and creative use of their signature abilities... and the more characterization-based style, where heroes dealt with supervillains and inner demons alike. One could say that the Silver Age ended when Jack Kirby, one of the creators of the latter style at Marvel, moved to DC, the mainstay of the old-fashioned approach. However, Steve Ditko, the third major founding talent of Marvel Comics and co-creator of Spider-Man, had crossed over before him. The Silver Age was, in a word, silly. Especially by today's expectations. Due to the assumptions of The Comics Code, creators were generally restricted to creating entertainment for children, and the Code's guidelines as to what was age-appropriate were very strict, precluding a lot of possible storylines that might deal with more mature themes. The '50s also saw a general turn toward conservatism in American society as a reaction against the disruption of the War, and pushing the envelope or questioning social norms was frowned upon. This is most obvious when it comes to female characters, who had been more independent back in the Golden Age  this is the era when Wonder Woman became vaguely apologetic about rescuing male characters; and Lois Lane, who had been portrayed as an ambitious career woman before, decided her main goal in life was forcing Superman to marry her and becoming a housewife. Morality in Silver Age comics was extremely black and white; heroes in particular followed a strict, moralistic code of conduct. Since dealing with serious real-world issues was frowned upon, wacky Speculative Fiction plots that bore no relation to reality became increasingly common. Supervillains' plans were usually more goofy than genuinely threatening. Superheroes had names like [Something Person] or [The Adjectival Superhero], which would seem too narmy today, and they would develop New Powers as the Plot Demands no matter how flimsy the justification or how absurd the power (one word: super-weaving ). Since realism and consistent characterization were not exactly high priorities, the age saw a lot of Superdickery; Silver Age Covers Always Lie, and characters would frequently be seen doing something bizarrely out-of-character on the cover just to attract more buyersnote In fact, as the story goes, it was not uncommon practice for the eye-catching cover to be created first, and then passed off to the writer, who then had to shape a story around it. Depending on who you ask, all this wackiness is either the Silver Age's fatal flaw or all part of the charm. Another fascination of the Silver Age was Science! The Silver Age occurred alongside The Space Race. Science was the answer to, and source of, every problem. The mutations of the X-Men, the alternate universe known as Earth-2, the alien conqueror known as Starro  the genre was filled to the brim with Speculative Fiction Tropes. Many of the more fantasy-based heroes of the Golden Age were remade with scientific origins and powers. Of course, the science wasn't necessarily very scientific. The authors were rarely scientists themselves, and even those who were didn't let the facts get in the way of an exciting story, especially when the stories were already so goofy. Thus, you had stuff like ice missiles that were attracted to speed, people who were exposed to radiation receiving superpowers instead of cancer, and so on. Which is not to downplay its significance, mind you. Many of the most famous comic book characters and story-lines came from this era (The Avengers, Spider-Man, X-Men, Daredevil) and many new ideas were created that would become standard in future comics: Superheroes as a social platform? The teenage masked hero? They started here. As well as how already existing characters were changed. (Many of the most famous elements and characters in The Green Lantern were non-existent in the Golden Age). And despite its reputation as being whimsical, this view is often based less on the actual comic books and more on its parody or the Batman TV show. While it generally had a lot of silly moments, it was also host to surprisingly mature storytelling at times. Over time, social mores relaxed and the moral panic around comic books faded. The Superhero genre began deliberately distancing itself from Silver Age silliness in an attempt to prove that comic books were a medium that could tell stories that were relevant to adults as well as kids and could deal with serious real-world issues. This trend toward a more serious tone and more socially relevant stories continued throughout the Bronze Age and culminated in the grim darkness of the Dark Age. In the Modern Age, however, the pendulum has started to swing back (which might qualify the various Ages as parts of a Cyclic Trope). Batman: The Brave and the Bold, which ran from 2008-2011, attempted to revive the age in a modern setting. The Night Gwen Stacy Died (1973) — Credited with ending the Silver Age. The Flash considered to be the founding comic of the Silver Age. It introduced the Alternate Universe to The DCU and in general exemplifies the age with its out-there science fiction reimagining of old gimmicks. Superman's Pal Jimmy Olsen and Superman's Girl Friend, Lois Lane. Both spinoffs from Superman and notable for their often bizarre plots and even more bizarre science. They were so remarkably campy that they could be read as outright comedy nowadays. 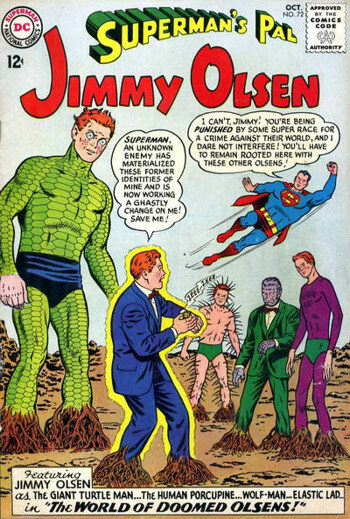 The former series is generally thought of by comic readers as the single most stereotypical example of Silver Age tropes, especially in modern Shout Outs. The brilliant computer game Freedom Force and its almost-as-brilliant sequel Freedom Force Versus the Third Reich, both from Irrational Games, are loving homages to the Silver Age, played 100% straight. Another homage is Alan Moore's 1963 universe, a series of interrelated comics that are all affectionate parodies of the early Marvel books. "Holy Musical B@man!" is an homage and affectionate parody of superheros in general, but with a special emphasis on the Silver Age. The moral of the play is essentially "don't take it so seriously," and "superheroes are cool in their own right and don't need to be made dark or gritty to be entertaining." A teenage sidekick ruins the gritty realism of a man dressing as a bat and fighting crime." Usually accepted as lasting from the foundation of The Comics Code until Jack Kirby's move to DC. (1954-1970). Alternatively starting with the reintroduction of The Flash (1956), or the first issue of Fantastic Four (1961). Alternatively ending with price increases to 15 cents (1969) or The Amazing Spider-Man #100 (1971). Many also argue that The Amazing Spider-Man #121 is a much more important and fitting end: The Night Gwen Stacy Died, in which the violent death of a major sympathetic character in a manner other than Death by Origin Story killed off both the optimism of the Silver Age, and its Status Quo Is God.